Clarity comes from interesting sources. 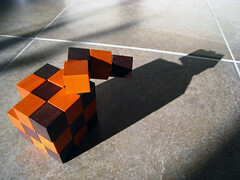 My clarity comes from my tinkering with a snake cube – a simple 3x3x3 wooden cube chain. How are your puzzle skills? I have been considering different approaches for capturing, filtering and modeling social media engagement data for some time. Like most other practitioners I talk with – we are generating more data than we can analyze. I have a stack of Short URL data, another with SEO data, another with Media data, another from Web Analytics, more from Social Media Analytics – Facebook or YouTube Insights, newly added Listening data, updates from CRM, with the newest and largest stack from Moderation. Certainly you may have more …. What do you do with your data stacks? The burden of ownership of these stacks is that they are a combination of structured and unstructured data. We can neatly capture the structured data like time, date, profile name, network, location, browser type, tags, etc … The unstructured information is where many times the real insights exist. This is where we will find comments, blog posts, video responses, photos shared, etc … It is the balance of content with context that provides us with the real world relationships that describe the editorial measurement, community health or overall social engagement. This is the challenge of social media measurement as it is combines your web analytics standards with those of your social media data. O’Reilly Media (@oreillymedia)author, Sean Power (@seanpower) lead an Enterprise 2.0 Boston (@e2conf) session this week that aligned with my approach and offered a deep course in this integrated analytics or communilytics approach [see slide 95 to visualize this synthesis]. This brings the insights team off the sidelines and into the planning and delivery of the program goals. Insights are in the eye of the beholder when it comes to measurement. The lens that I view these data stacks is very different than my colleagues that are observing from the lens of eCommerce, Marketing, Brand Manager, Public Relations, Customer Service, Investor Relations or Information Technology. Each functional organization has different data elements that can be organized to model a possible solution set relevant for their insights. This dynamic is what drives the collection of these data stacks but the hoarding of data does not benefit the enterprise if it is not accessible and flexible. Your collection of spreadsheets containing silos of data – only useful to the limited asynchronous owners. This model is single dimensional and focused on the structured data. This brings me back to the snake cube. The view of this information reminds me of a project I worked on a project a few years ago where we modeled structured and unstructured video data to help inform a fantastic video search engine – dabble. The model we used was the OLAP cube to bring dimension to the data stacks we had maintained to develop new products with the core meta and search data. Capturing these data stacks as a cube offers as one of many forms of business intelligence to model your analytics. Bringing this agility to your data stacks to unlock insights will open the possibilities for you and other supporting organizations to develop formulas and benchmarks that bring the insights and evidence to fund, scale and better engage your communities. Embracing this flexible and business intelligence can move the social media efforts into the center of your brand planning rather than an after action review. Gatorade (@gatorade) and PepsiCo (@pepsico) has harnessed this approach to power the Zeitgeist and Mission Control center. Are you ready for your analytics and analysts to have a seat at your digital table? What color is your Persona? We measure our friends, feeds and followers yet do we know what we are really communicating non-verball? Looking into your search spectrum via this fantastic MIT visualization experiment – Personas part of the Metropath(ologies) installation at the MIT Museum. Here are the results for Peter Fasano. Try out yours. The massive growth of the blogosphere has matured and now transitions to other areas of the social webs. Like the democratization of media so goes social media. Thus the Statusphere is born (Great TechCrunch read)! Who are the influencers and authoritative sources in your communities? How are you measuring? What is the social graph of your current influencers and where are they strongest? social media measurement and influence. While many of the marketers we have interviewed are taking baby steps to measurement of influence or authority by looking at Technorati ranking or post/comment ratio within their ecosystem – none have taken into consideration the measurement of authority outside the blogosphere. In well executed social media marketing programs, marketers are planning strategy and engagement across the social fabric to include image sharing, social networks, virtual worlds, music, events, wiki’s, blogs and of course microblogs – see Skittles (not claiming well executed – but is an example of reaching the channels). The decentralization of content distribution, content creation and conversations is a measurement nightmare for sure but not an area to ignore because if is hard. Any strategist worth their rate should start with listening and qualifying the communities that they will be engaging. Measurement of authority level for community outreach outside blogosphere seems obvious but is rarely done. Relying on the blogosphere or stable of blog ambassadors is good practice but not practical to the dynamics of media today. This is like the old PR agency that maintained the relationships with the reporters of influence so that the key print and TV would pickup your story to potentially earn media exposure. Today, that model has expanded to include key bloggers and niche media but not likely to include the rock stars in Twitter, Facebook, Digg, etc … There are many ways to approach measurement of authority and the best one comes with time and engagement of your community in your ongoing analysis of your data. Feed your Social CRM with all your campaign data and communication data. The data will help you understand the true profile of your community rock stars and lead you on the path to the statusphere. Stay curious and share your thoughts.